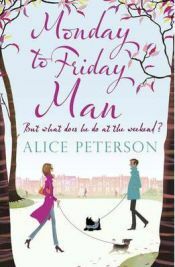 ‘Monday to Friday Man‘ is Alice Peterson’s latest novel and is thoroughly enjoyable. Although in many ways it is a light and easy read, it does also make you think as she tackles a couple of difficult issues. It is an immensely readable book that you should be able to read in just a few days – in fact it’s perfect lazy summer reading! The main character in ‘Monday to Friday Man‘ is thirty four year old Gilly who has recently been jilted by Ed just days before the wedding. With her thirty-fifth birthday approaching, Gilly feels that her life is in a rut and it is time for a change. That is why she is soon found advertising for a Monday to Friday man, or in other words, a lodger who only stays during the week. He must like dogs though as Gilly already lives with the faithful Ruskin and she is found every morning walking with the dog walking group in the local park. After meeting a few unpromising prospective lodgers she settles on Jack Baker for whom she feels an instant attraction. Unsurprisingly, before long the landlady and the tenant become more than just good friends. It’s a shame that he is only there from Monday to Friday though but when Gilly suggests that he stays at the weekends as well, Jack becomes elusive and secretive. She can’t help wondering what he is hiding from her and exactly what he does do at the weekends. Gilly’s dog walking friends are all very concerned about her emotional welfare and want to make sure that Jack does not let her down the way Ed did. Most concerned is Guy who possibly wants to be more than just good friends with Gilly too! All in all, it made a very entertaining and easy read that kept me happy from the very first page. I loved all of the characters in this book, particularly the dog walking set who really are quite a diverse and colourful bunch. I really felt the sense of friendship and caring as I was reading, all centred on Gilly who definitely is a loveable character. She is also someone that it is possible to emphasise with, particularly if you are in your thirties but have yet to meet Mr Right! It reminded me of a time when all my friends were settling down and having babies whilst I was lurching between disastrous relationships! I really recognised how Gilly was feeling much of the time and her sense that time is running out for her is portrayed very well. ‘Monday to Friday Man‘ is not a frivolous read by any means though. This is because Gilly has had some challenging issues to deal with – the tragedy of losing a severely handicapped younger sister and the subsequent abandonment of her and her twin brother by their mother. There are some quite poignant moments as this part of the story is revealed through a series of flashbacks that intersperse the lighter moments. Overall, ‘Monday to Friday Man‘ is a very enjoyable read about relationships and friendship. It is also a little bit about following your heart and not worrying about the things that you cannot change such as Gilly’s impending thirty fifth birthday! It is a book that will make you laugh and make you cry as well. One Comment on "Monday to Friday Man"
What a lovely review, I’ve read the book too and loved it too. Highly recommend it to anyone looking for a great summer (or all year for that matter) read.